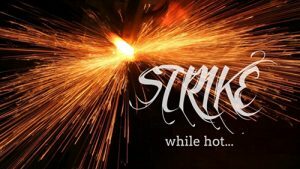 Strike While the Iron is Hot | GetAlongWithGod.comGetAlongWithGod | A blog about discovering a God worth knowing. If the Spirit is moving in you to do something, it means He wants to move on it. I have missed the moment by waiting even minutes for it to be more convenient and lost the opportunity. The Spirit knows what I don’t and His timing is ALWAYS perfect. I am to strike while the iron is hot! Recently the Spirit was moving on me to record a video with Martha. We knew we were to do one but we were waiting on the timing. 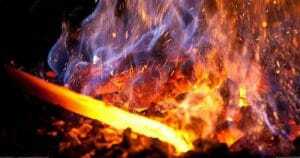 The Spirit moved while I was driving home and I thought, “I will just get us home and we can do it then.” When we got to our location to video, His fire had dissipated, which made it more difficult. And although God had mercy on us and allowed us to do the video, it wasn’t perfect. We had to do a number of takes and there was a stress in it. The Holy Spirit knew something my logic thought it knew better. Yuck! We all should walk in reverence, as our every moment is holy. When we are the Father’s, and Christ’s Life is our life, we dwell in His Will. This means God dictates all of our where’s, when’s, what’s, and how’s. This is both freeing and frightening. Frightening because we do have access to a nature that prefers our mind over the Will of God. But more importantly, it’s freeing because as I walk yielded to Him, I am free from the striving of my flesh. His Life is peace while logic is a cruel mistress! This one situation was a microcosm pointing to a macrocosm. I don’t want to let the mind of my flesh have even the smallest leeway. My logic enthrones Satan and gives him permission to bring chaos and death. As we step into a conference season, the fire gets heated up. The temptation is to focus on expediting tasks, making them serve my goals rather than my surrendering to and living in God’s Will. It happens in the most minute of circumstances but it has eternal significance. My choice is surrender! Would you stand with us as we embark on this conference? We desire it to bring forth His Life, to strike while the iron is hot—not bringing our logic and wills. When I come up against the Law I want to do good, but in practice I do evil. My conscious mind whole-heartedly endorses the Law, yet I observe an entirely different principle at work in my nature. This is in continual conflict with my conscious attitude, and makes me an unwilling prisoner to the law of sin and death. In my mind I am God’s willing servant, but in my own nature I am bound fast, as I say, to the law of sin and death. It is an agonizing situation, and who on earth can set me free from the clutches of my sinful nature? I thank God there is a way out through Jesus Christ our Lord. Would like to learn to follow the Holy Spirit as a Guide in ways I don’t know right now; He knows what’s up ahead. Standing with you for His purposes at the conference. Bless you Pauline, and thank you for your prayers! This is going to be a great conference. Wish y’all could come but I know you will be there in Spirit as you pray! I really liked this version of the verse! I think I never heard it before! A most hopeful verse too! May we never stop choosing to surrender in the moment, and especially never forgetting that we have the choice!! May this conference be a love exchange to all of those who will be there!! I refer to the Phillips version a lot. It is only the New Testament but I like checking scripture there often. Thank you so much for your prayers Sandy! Truly God bless you! Great word; this goes to the core of what is SURRENDER. Thank you Bruce. I really liked this one and the object lesson is something I won’t forget anytime soon. Bless you!